UK supermarkets and scientists are working together to find ways of reducing potato greening which costs the industry and retailers almost £100million every year. Researchers at the James Hutton Institute have identified a genetic element to the problem which can mean a seven or eight fold variation in the amount of post-harvest greening. 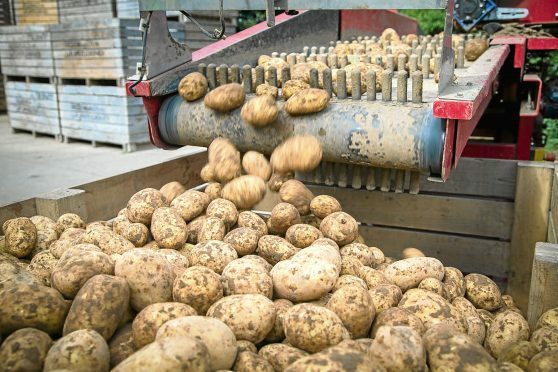 Tuber greening is directly linked to 116,000 tonnes of household potato waste and is estimated to cost UK retailers £60million per annum. In-field losses due to greening cost the industry another £37million and the problem has also been identified as a negative factor in consumer purchases, in a market where a 1% increase in sales is worth £3million to producers. The aim of a new joint industry and science project, funded by Innovate UK and the Scottish Government, is to reduce waste and increase productivity. Speaking at the Potatoes in Practice event near Dundee, Dr Mark Taylor of the James Hutton Institute said work on 200 different varieties had already identified the genetic regions that control post-harvest greening. “Undoubtedly greening in the field is affected by the depth of tuberisation but that is a separate issue from post-harvest greening,” he said. Recently developed potato genetic approaches will be used to identify markers for genes associated with reduced greening to provide the foundation of a longer term strategy to produce non-greening potato varieties. The project has brought together partners including Tesco, Waitrose and Branstons.